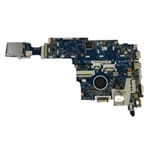 Description: Refurbished Acer netbook motherboard. This motherboard comes with an AMD Fusion C50 processor, 3G capabilities & the cpu fan. Part #'s: MB.SFT02.002, MBSFT02002, LA-7071P.